It’s easy to write off Florence as a dusty, small town whose chief industry is prisoners in the state pen and a federal detention center. But visitors are advised to look a little deeper to find a charming town with close to 100 historic buildings and a terrific, walkable downtown. 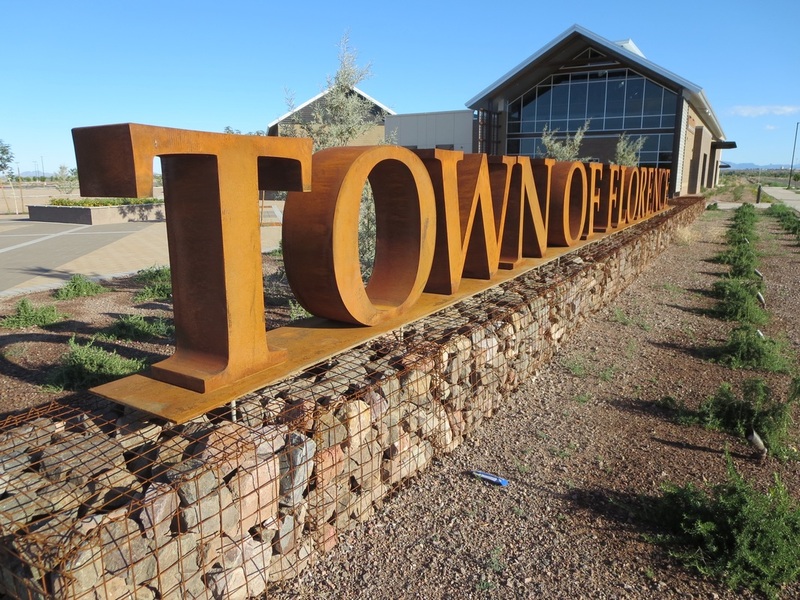 Florence, which celebrated its 150th anniversary in 2016, is well worth a day trip from Phoenix an hour away or from Tucson about 90 minutes distant. The hardware store on Main Street, a Norman Rockwell throwback, occupies the White-McCarthy Building. Step inside for a look at the stamped-tin ceiling, wooden floors and an intoxicating hardware store aroma. It even has a hammer for a door handle. Next door is a 1915 building that was Mandell’s Department Store for 70 years. Awnings shade the storefront windows and a unique island display case gives new meaning to window shopping. — The Truman-Randall House was built with adobe bricks in the late 1880s by Sheriff W. C. Truman. He was best known for capturing Pearl Hart, the woman who robbed the Florence-to-Globe stagecoach in 1899 with a sidekick named Joe Boot. — Dr. Wallace Randall, second owner of the Truman-Randall House, was murdered by his nurse in 1922. A Florence historian says the nurse shot him because of his sexual advances but she went to prison nevertheless. Dr Randall's widow befriended the nurse and took soup to her in the Florence prison, according to the historian. — Rancher and farmer John Nicholas moved his saloon and beer hall into one of Florence’s first fired-brick buildings in 1889. The flat-roof building with a full basement included a steam-powered fan to keep patrons cool while they sipped their beer and whiskey. It’s now a dentist’s office. Kramer Sr. The adobe building is now the office of the Florence Reminder and Blade Tribune newspaper. 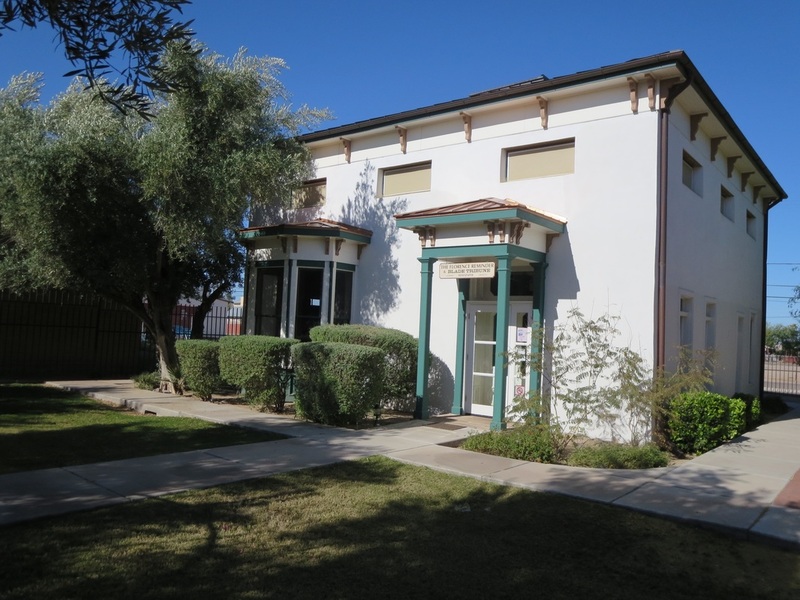 ​— The Pinal County Courthouse cost the taxpayers nearly $35,000 to build is 1891. The county ran short of money and could not afford a working clock for the courthouse tower. Officials settled for a “clock” frozen in time at 11:44 that is right twice a day. 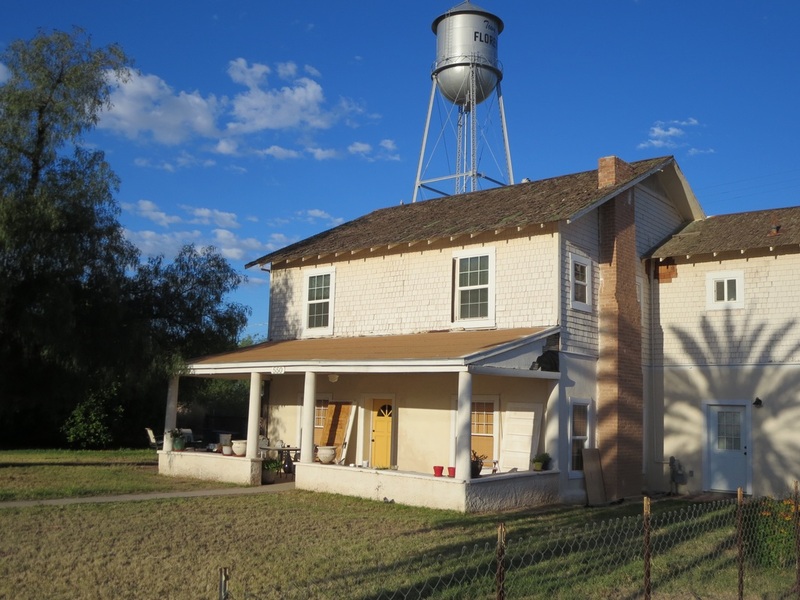 Florence is home to the McFarland State Historic Park, which occupies the first Pinal County Courthouse, built in 1878.The Pinal County Historical Museum has a fascinating collection of Florence's ranching, cowboy and territorial history. That includes remnants and photos from the Tunnel Saloon, where former Sheriff Peter Gabriel survived a brutal gunfight with his ex-depty Joe Phy, who was killed. The Florence museum also has a grim collection from the Arizona State Prison. It includes a trap door for hangings, a double gas chamber chair for two brothers and a series of nooses with photos of those men and one woman who were executed by hanging. Yes, Eva Dugan was hanged in 1930 for killing a Tucson rancher. She is the only woman to be executed in Arizona. Finally, the museum has a collection of Tom Mix memorabilia. The silent-movie cowboy star crashed his luxury Cord automobile in a fatal accident Oct. 12, 1940. There is a memorial for Mix about 16 miles south of Florence on State Route 79. Just north of Florence on the Hunt Highway is Poston’s Butte. Charles Poston, who dubbed himself the Father of Arizona, is buried atop the butte at an elevation of 1,748 feet. The site includes a pyramid monument. Poston went to Washington in 1863 to convince federal officials to create a separate Arizona Territory from the New Mexico Territory. Poston’s Butte hikers should turn west off State Route 79 just north of the Gila River onto the Hunt Highway. They can park near a railroad trestle about 1.5 miles west of SR 79 and walk under it to get to the trailhead. It's not a long or difficult hike to the summit. 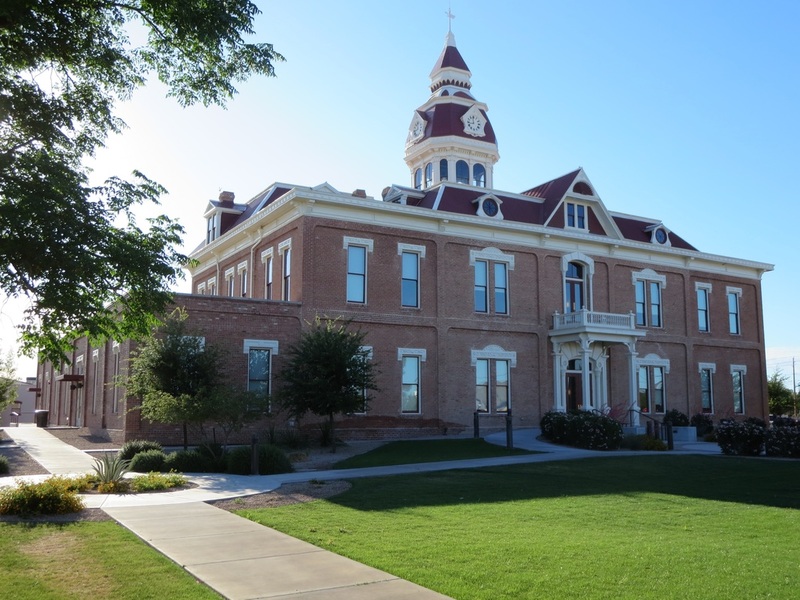 Pinal County Courthouse, built in 1891, is reportedly Arizona's oldest public building still in use. It was built for $34,765. Truman-Randall House was built in the 1880s. 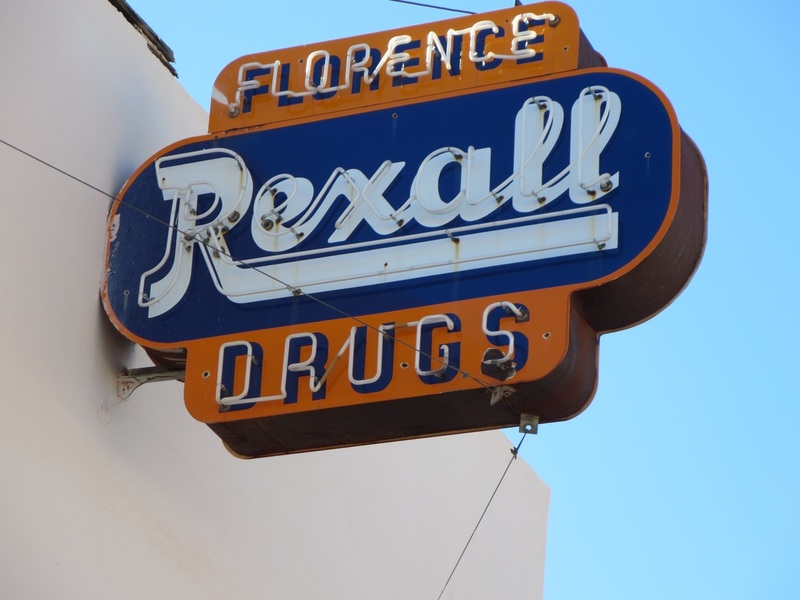 A rare Rexall sign is still there on Main Street. 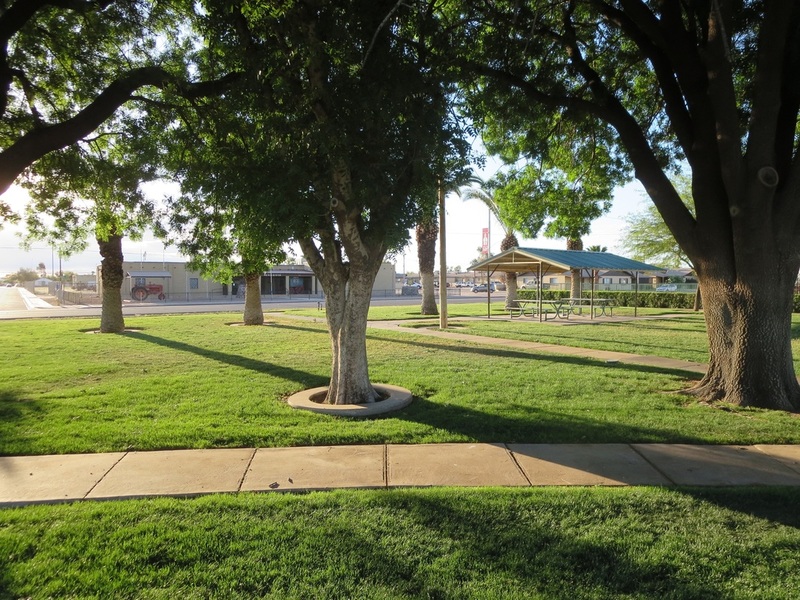 A shady Main Street Park in sunny Florence. The Happy Adobe sells home and patio decor items, and yard art. The restored 1884 Willam Clarke House is a newspaper office. John Nicholas moved his saloon and beer hall into this 1889 building and reportedly cooled patrons with a steam-powered fan. It's now a dentist office. 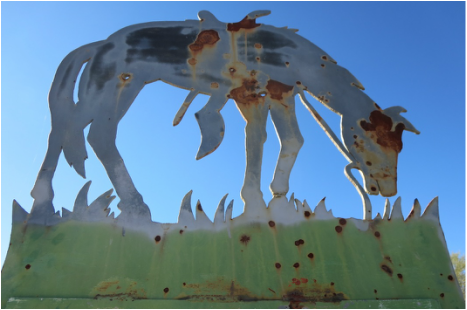 The Town of Florence completed a new library, pool and community center in 2015 at 778 N. Main St.
Tony "The Wonder Horse" is memorialized at the historical marker near Florence for silent film cowboy Tom Mix, known for his trick-riding skills. 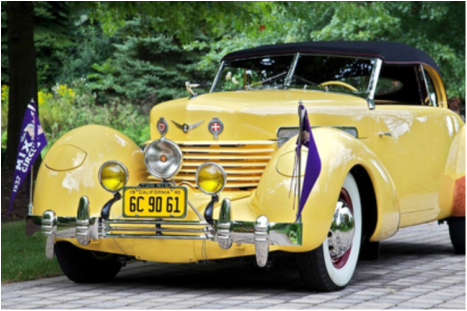 In 1940, silver screen cowboy Tom Mix drove through a road barrier at high speed and died in this 1937 Cord 812 Phaeton, restored in 2012.